This title is a major step up from the graphics and gameplay of the first Zelda game on NES. The name is really misleading however. 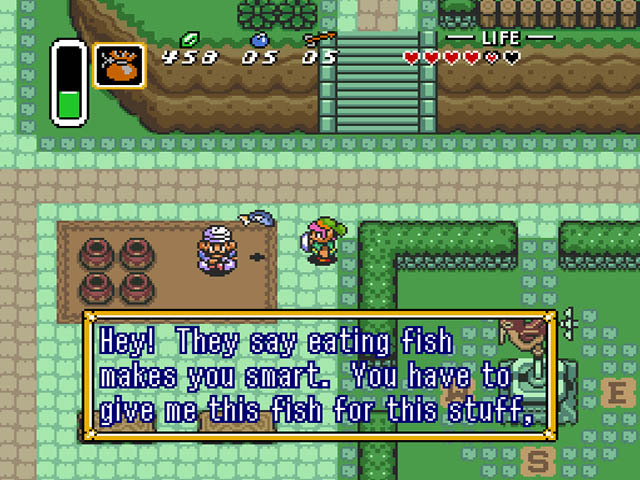 You play as young link, nephew of a swordsman who dies immediately and gives you his sword and shield which you can use better than him. 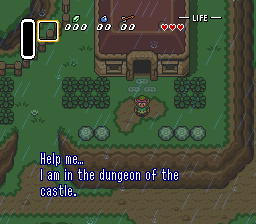 You carry on to the dungeon of the castle and save Zelda. No seriously, you save Zelda in the first 3 minutes of gameplay. 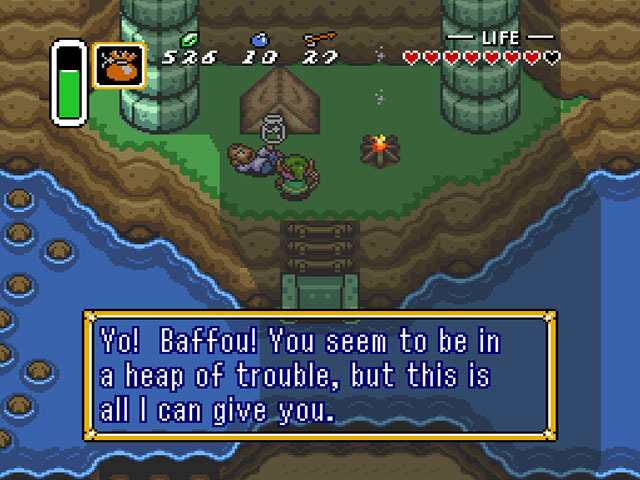 After escorting Zelda to a sanctuary you are branded a kidnapper by the Hylian knights under control of the evil wizard who's name eludes me. Something with an "A"... "Aginimminahmana"... "Agamemnon"... No, that's Greek Mythology... Semantics. Anyway, wizard. Evil. Antogonist. Plot importance. The wise man of the sanctuary sends you on your first quest: Finding the 3 pendants. They serve as a fashion statement that the Master Sword respects and let's you remove it from the pedestal it is placed it. 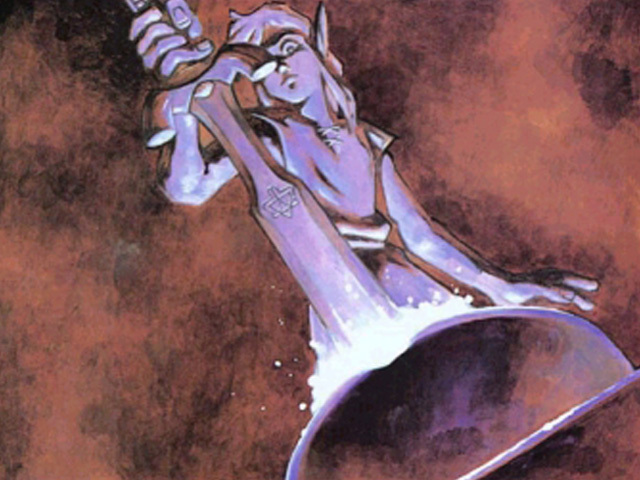 Now that you have the Master Sword it's time to do plot important things in the Dark World. Vagueness preserves story for those who haven't played yet. Now you must save the other princesses from Ganon's wrath (don't tell Zelda). Ganon will beak the seal, unleashing terrible cosplay and internet trolls in all of Hyrule if you do not succeed. No pressure. All in all, a great game. Common enough to be easily purchased on the web or at a community market. Classic enough for people to try to rip you off. Shop smart if you want the cartridge. This extremely bad review is brought to you by arbleich, caffeine, and the letter R.
Long ago, the goddesses who created the land of Hyrule sealed away their power in a mystical relic called the Triforce. Legend said the Triforce would grant the wish of anybody who found it, and the wish would take on the form of the wisher’s heart – good or evil. People began fighting over the Golden Power, so the seven wisest sages used their power to seal the Triforce in an alternate realm known as the Golden Land, forever away from human hands. But years later an evil man named Ganon found the way there, and his dark heart transformed the Golden Land. From there, he’s kidnapped the seven maidens of Hyrule – the descendants of the wise men, and schemes to use their power to break free and spread his darkness all over Hyrule. You, as a young boy named Link, have been chosen to fight Ganon and stop his evil once and for all. The setting should be familiar to anybody who’s played a Zelda game, but that’s okay; it’s nearly as timeless as any real legend. 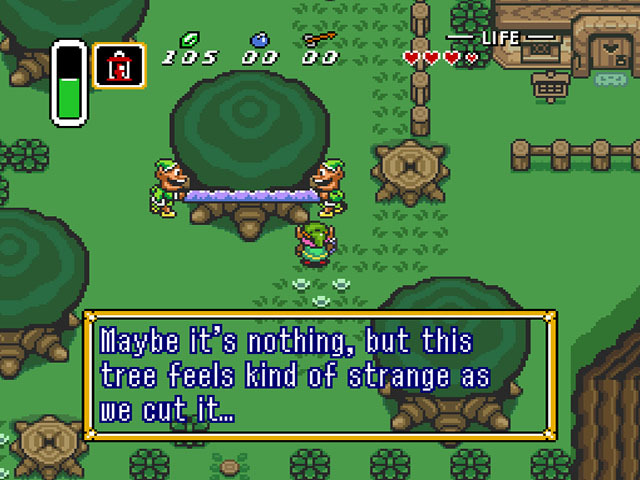 A Link to the Past is one of Nintendo’s crowning achievements on the Super Nintendo, and one of the best games ever created. It’s an action-adventure game, and in it you journey across Hyrule and the Dark World to find clues and hidden treasure to help you defeat Ganon. You solve puzzles in elaborate dungeons, defeat big bosses, and earn new powerful weapons and other items to assist you. The puzzles are satisfying to solve, and like many Nintendo games, they challenge but not frustrate. It’s an incredible game, and nobody’s Super Nintendo collection should be without it. Get it, now! If you haven’t played it, you owe it to yourself to. This is the First Installment of wat they make later into Ocarina of time on N64 These games are almost identical provided a few differences in gear but one of the best games of all time both this version and the second version on N64. 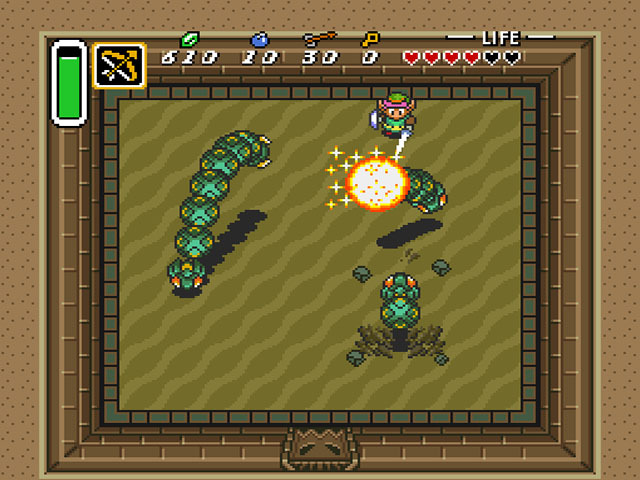 You play link and rescue the princess from Ganon's Evil clutches but just after u recieve the conduit to destroy the evil u are swept into the Dark World and must collect More stuff to go up against Ganon the game isnt very long but the puzzles and game play extend it a little bit. After all said and Done Very Good Game one that will be remember for centuries to come. 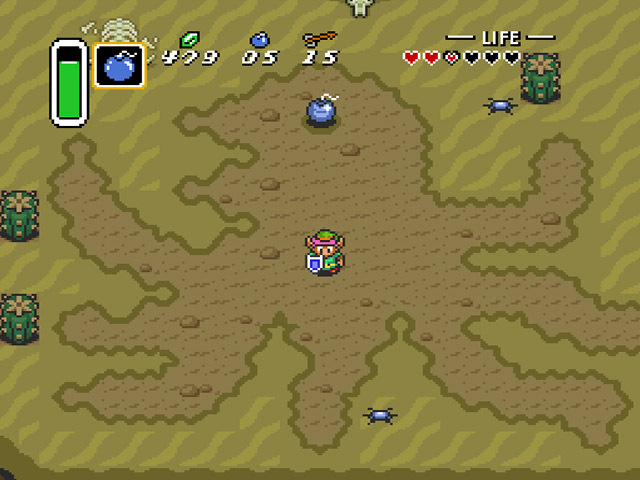 Arguably the best Zelda game made, this game combines amazing music and great gameplay. The graphics are really good too, if you're into that. If you've played before, you'll know exactly what to do and you'll still be challenged. 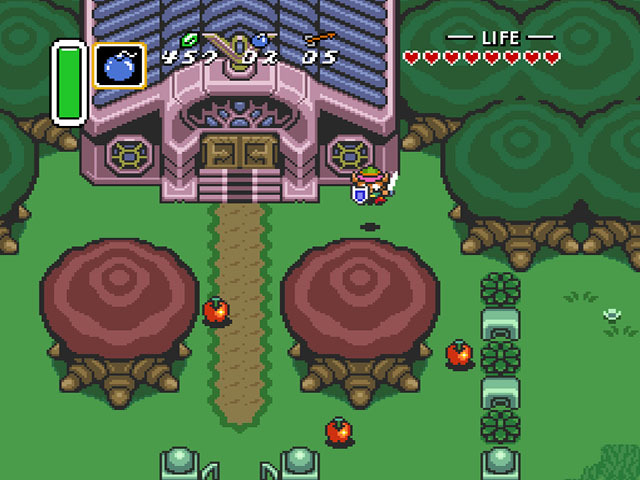 This game is actually pretty hard as Zelda games go, and it's one of the best times you'll have. If you haven't played before, you won't be lost but you'll be roaming around for a long time trying to find secrets and other items to help you take down your enemies. You're gonna be playing for a while, and I promise you're going to love it. This is one of the best games of all time. It is the best RPG ever. Youare Link a young warrior summoned by princess Zelda to save her from Gannon, the evil wizard. There are many different lands. you must take your time and search around to proceed because you could miss something important. it took me months to finish, and even after you defeat gannon and save the world you'll want to start over again and play through it. It is one of the most beautiful games for the SNES. It's smooth scrolling and rounded edges utilize the power that was the super Nintendo Console . 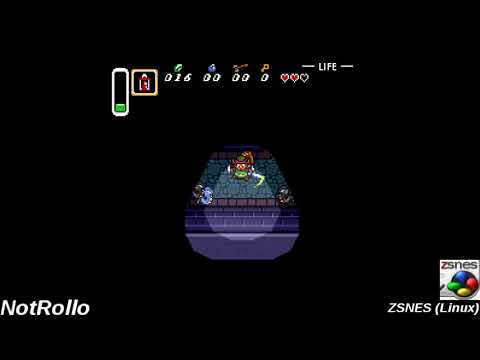 The music is entrancing and you get pulled into hyrule through the music. 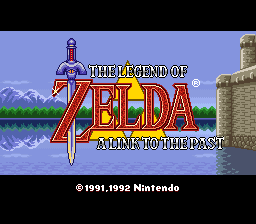 Read all 10 reviews for Legend of Zelda, The - A Link to the Past (USA) Submit your description for this title! Now you can add videos, screenshots, or other images (cover scans, disc scans, etc.) 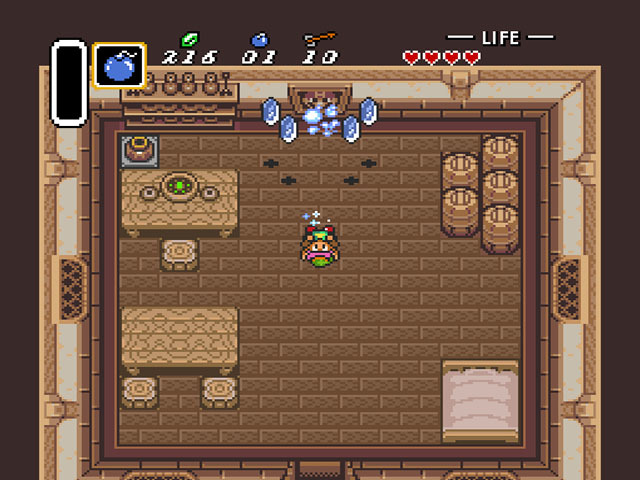 for Legend of Zelda, The - A Link to the Past (USA) to Emuparadise. Do it now!